Mild cleansing lotion. An economical alternative to expensive bar and lotion soaps and ineffective abrasive powders. Cleans thoroughly. Produces abundant lather in hard or soft water. Soap Type: Liquid; Application: Hand; Capacity (Volume): 1 gal; Scent: Floral-Lavender. INNER PACKAGING: 4 Bottles Per Case. 1 Gallon Per Bottle. 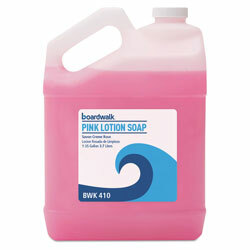 1 Gallon Pink Bottled Soap from Boardwalk! 3467 In Stock today.